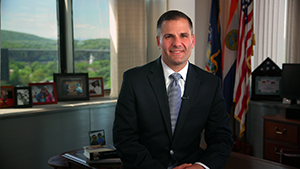 Dutchess County Executive Marc Molinaro presented his 2017 State of the County Address on Thursday, February 16th at the Culinary Institute of America. "Happiness is having a large, loving, caring, close knit family … in another city." Family. No matter what it looks like or where it resides, family is where we should be safe, healthy, and content. Family is where we seek to calm our fears, nourish our hopes, and bring us together. It is that one place that is resilient enough, loves enough, and can be a constant source of support, inspiration, and relief. At least, it ought to be. In my case, my grandparents encouraged us to serve others and make a difference. My parents raised us to respect others, be honest and work hard. My wife is that source of calm, strength, and patience. And, our kids, well … they remain our hope and inspiration. As many of you know, Corinne and I welcomed Elias Adams Molinaro into this world just seven weeks ago. We are grateful to the caring people at Vassar Brothers Medical Center – yes, we took him to Vassar – and our family, friends, and neighbors for your kindness. Eli – new life – provides us that opportunity to ask, “Are we doing all we can for those we love?” Abigail, Jack and Eli give us hope. They also demand a lot of us, deserve a lot from us, and remind us how important it is they, and all kids, have a home, a family, a community that is a source of safety, opportunity and love. Yet every family deals with struggle – yours, mine, ours. Whether health or financial difficulties, unexpected crisis or lifelong challenges, families have much to endure. Ladies and gentlemen, the state of Dutchess County is strong. The state of the Dutchess County family, however, can be healthier, safer and even stronger. All are interrelated. One network of mutuality. One single destiny. Our community, and the families within it, are woven together in one fabric. And as we have successfully worked to improve our overall quality of life and boldly challenge ourselves to build a community that is stronger, healthier, safer, and kinder, we know there is more to be done. In New York State, too many work too hard to make ends meet. Too many small business owners confront too many hurdles to make payroll and stay open. Too many are simply working for the day they can move to a more affordable part of the country. New York does not make it easy to own a business or create new job opportunities. We, though, are doing all we can. In Dutchess, we have reorganized and redefined our economic development efforts, consolidating under one brand with a more flexible, more agile, more aggressive operation to strengthen existing businesses while making our county a magnet for new ones. Our work is attracting small manufacturers; expanding our food and beverage industry; supporting one of the largest distribution centers in the Northeast recover from disaster, while growing new industries and supporting innovators, entrepreneurs, and new tech jobs as Dutchess remains the epicenter of mainframe technology. Our Th!nk Dutchess Alliance supports over $3.2 billion in major investment for projects under construction or planning in nearly every corner of our county from data to healthcare (with Northern Dutchess Hospital completing an amazing expansion of service and Vassar Brothers Medical Center embarking on half-a-billion-dollar transformation of healthcare in the Hudson Valley); from revitalizing community centers in our villages, and in Beacon and Poughkeepsie, to new housing nestled into the Harlem Valley. In partnership with so many, our agricultural industry is growing again as new farmland is protected and farms expanded; Dutchess Tourism and our first-class destinations attract millions to our community; and our arts network provokes and inspires new visitors, new investment and new vibrancy. We have led the call for Albany to allow ride sharing in upstate New York. Th!nk Dutchess promotes Dutchess County as a great place to do business throughout America, while Dutchess Tourism attracts new film productions and visitors from across the globe. We continue to be staunch supporters of the Dutchess County Regional Chamber of Commerce’s call to “Think Local First” and are committed to Shop, Hire and Train Dutchess. Federal and state laws make it difficult for the County – or any government – to buy goods and services locally or require contractors and vendors to hire our local residents; but we are finding creative ways to do just that. Our Local Business Registry connects county departments with local businesses for the purchase of certain goods. When it comes to workforce development, Dutchess County is a leader. Our county Industrial Development Agency and Local Development Corporation have adopted a Local Workforce Utilization policy, tying incentives directly to local jobs, requiring that at least 80% of jobs for any incentivized construction project are hired from within our area. We are also ensuring a skilled workforce with changes to the County’s contract language for large building projects. Contractors are required to have a local training program that combines on-the-job skill building with related instruction at institutions like BOCES or Dutchess Community College. This leverages county dollars and expands our efforts to invest in an already diverse and talented workforce while providing new opportunities to those looking for a job or willing to retrain for one. The Department of Community & Family Services is leveraging career services and continuing our summer jobs program for teens through the Workforce Investment Board and Dutchess One Stop Career Center; enhancing workforce development with the Chamber of Commerce and Exodus; and connecting willing workers with transportation and employers through BOCES. These steps will help make us the most competitive and well trained workforce in America. One of the most powerful tools anyone can secure is a quality education. And like many parents, I want New York to do more to improve public education and how it’s funded. Dutchess County, though, has long committed to our greatest educational asset: Dutchess Community College. DCC has evolved to meet the needs of an ever- changing world with programs and services, including their new site at the Family Partnership Center and the innovative E-Tech program, enabling City of Poughkeepsie students to graduate with both a high school diploma and an Associate degree in engineering or electrical technology. And after six years of flat county financial commitment, Dutchess County has steadily increased our support – over $1 million in new funding in both 2016 and 2017. And I will recommend to the Legislature an additional $1 million for 2018. At the same time, if New York has the resources to provide new tuition assistance, it should first make good on its funding obligation to community colleges; that’s nearly $7 million to DCC, equal to the tuition of nearly 2,000 students. And, contrary to state law, Albany mandates that County taxpayers cover the cost for Manhattan’s Fashion Institute of Technology, costing Dutchess County taxpayers $1 million annually. This, too, should end! Strengthening our community college is one of the best ways for county government to impact and help area students and those seeking to access higher education. In this county, we are fortunate that from DCC, any student of any age has a chance to attend among the finest institutions in America. We will continue working with Marist, Bard, Vassar and the Culinary Institute to support their development, expand opportunity and grow this sector of our economy. Making sure Dutchess County assets are beneficial to our taxpayers has been a major focus of ours over the last five years, cutting subsidies and operating costs for maximum efficiencies. Nowhere is this more evident than our county airport – the Hudson Valley Regional Airport. A new name, new brand, new private management with new marketing tools are all bringing about new investment, new job opportunities, and new economic value. Last month our plan to build a Dutchess Community College Aviation Education Center received final approval. This partnership will expand their aviation curriculum providing new skills and job opportunities. This program, the only of its kind in the Hudson Valley, will help attract new businesses, create new jobs and, again, our community college will be the conduit. New York should do as we have, as Dutchess County leaders do every day: cooperate, collaborate, and lead. Our shared services and government consolidation efforts are a model for the state and have resulted in savings in ordinary ways like shared purchasing, County-provided IT support, and reduced workers’ compensation costs. And, with a commitment of over $7 million since 2013, our Municipal Innovation Grant Program has resulted in ground-breaking and extraordinary advancements, such as sharing assessors, consolidating communication tools among police agencies, land use assistance, and emergency response coordination and consolidation. We are tackling difficult challenges, including emergency medical services, with our EMS Task Force finalizing its report with extensive community data. We will bring stakeholders together to develop a shared community solution. With a focus on overall municipal innovation, in 2017, we seek to streamline local land use policy, planning, and zoning to make it easier to move development projects supported by a community from application to approval, strengthening our local economy and growing private-sector jobs. We will support greater law enforcement and public safety coordination among jurisdictions. By meeting regularly, supervisors, mayors, and county officials don’t just talk about more efficient, less expensive government – we deliver on it. Because of our efforts, communities are working to keep property taxes flat, and Dutchess County has lowered the county’s tax levy three years in a row. Except for some unforeseen emergency or new state mandate, these shared services efforts and the Taxpayer Protection Fund we established last year will enable us to continue providing taxpayer relief. Our local economy is stronger; our fiscal condition is healthier; and our efforts are focused on helping improve the financial condition of every household in this community. The County Legislature and I remain committed to keeping county property taxes as low as possible. So, too, are we committed to confronting longstanding stigmas and public health crises hurting too many in our family. We are focused on addressing drug addiction, mental health, domestic violence, and child abuse. Building on our successful and coordinated response to domestic violence, child abuse, and human trafficking, we have increased funding – now over $ 4.8 million – added a domestic violence outreach worker, new Assistant District Attorney, and expanded the Lethality Assessment Program. We are providing a comprehensive victim-centered approach to our prevention and response efforts. In all that we do, we are retooling a complex criminal justice system to change outcomes and focus on the individual. As we move forward diligently with the new Dutchess County Law Enforcement Center (LEC), we are well within budget. When we complete design and begin construction of the LEC this summer, we will move forward with design of our Justice and Transition Center. The State demands counties build and maintain jails, but we are going further, developing a new model – one that provides the right tools, services and resources – based on data with clearly defined outcomes, to help individuals break the cycle of criminal behavior and transition back to a job, a community, a family that supports their success. Continuing to expand our Alternatives-to-Incarceration programming, we will seek a private-sector partner to build transitional housing with supportive services for those with various behavioral health issues, creating another tool to aid those leaving the criminal justice system for a more successful return to the community. As New York seeks to legislate public defense at every step of the judicial process, we have already been doing it. As New York promotes pre-trial services, we are already providing them. And while New York talks about criminal justice reform, we continue lowering inmate population by investing in programs like our own RESTART and the Women’s Reporting Center to keep people out of jail. That’s how we will transition individuals already in the criminal justice system back into the community. But if we are to make the family safer, healthier, and stronger, we must do more to prevent them from entering the system in the first place. Our kids have all the potential in the world. Every day they are confronted with challenges, obstacles, and choices. As parents, we pour our hearts and knowledge into them knowing we can’t always be there to protect them, and they need to grow in their independence. Their lives will meander down a winding trail of twists, turns, and divergent paths. Some lead to heartache, some to happiness, others to limitless possibilities, and yet some paths can lead to problems. As a community, we must do more to strengthen the pathways to great promise and close that infamous pipeline to prison. Dutchess County’s “Path to Promise” begins by funding and leading a comprehensive analysis and development of a bold plan of action for our youth. We have committed $500,000 to review programs and services, identify how they’re offered, what are the defined outcomes, are we succeeding, and where are the gaps in service. We will consider every age group from birth to college, every community, and every provider – from churches to not-for-profits, schools to governments. Our “Path to Promise” Action Plan will establish short-term goals and long-term principles. The plan will include tools to measure success and help determine how we commit an additional $1.5 million for a youth services center. This work, led by a steering committee of stakeholders, will include a third-party consultant, extensive public outreach and at least one countywide youth summit. It will also include a comprehensive review of how county government provides services and assistance to young people, for a radical new approach. Children need a family, teachers, coaches, and counselors who believe in them. That’s why we are proud to partner with the Boys & Girls Club for a comprehensive after-school program at the New Hope Community Center in Poughkeepsie. But there is still much more work to do to ensure the right programs and necessary solutions are in place to empower our kids and give them a sense of self-worth. And with that, competence and confidence. As we take these steps along the “Path to Promise,” we continue confronting the public health crisis of our lifetime: opioid and heroin addiction. This epidemic affects every community, every race, color, creed, and level of income. Our community, our interrelated family, is losing too many lives; and as much good as we do, there is much more to be done. Our Mobile Crisis Intervention Team, HELPLINE and first responders are saving lives 24 hours a day, seven days a week. We are well on our way to training law enforcement, first responders, educators and counselors in Crisis Intervention and Mental Health First Aid. And our Stabilization Center is now open, bringing together all our mental health resources in New York State’s most progressive model. Yet despite all our work, pain medications are too readily available; illegal drugs flow too openly; and too many think addiction is a choice. We will fight this battle on all fronts. We will expand the reach of the County’s drug task force, continue building community coalitions with our partners, educate students and families, and provide help to intervene and support those on their road to recovery. To make it easier to dispose of prescription drugs, we will expand drop-off points and better promote their locations. Some local pharmacies already accept unused medications, but I am calling on all pharmacies in Dutchess County to participate in this life-saving, community effort. And as we ask them to participate, we also implore Albany to legislate they do so. Additionally, the Department of Behavioral & Community Health will develop an Acute Pain Management Certification – a commitment by local physicians to address over-prescribing and employ better pain management to prevent addiction and limit access to these powerful drugs. We must all recognize that recovery is complex and requires many tools; and so we will also expand our Medication Assisted Treatment programming in the community and Vivitrol (an opioid blocker) assisted program in our jail. These steps and more will further protect kids, help save lives, support those on the road to recovery, confronting this national epidemic. There is nothing in New York State like our Stabilization Center. This 24/7 facility diverts individuals living with addiction or mental illness, or on the verge of mental health crisis from emergency rooms or jail. Collaborating with our partners, we now have a single point of service where we provide the right care in the right setting in order to improve and save lives. We thank the Department of Behavioral & Community Health and so many others for their work to make this a reality. We are especially thankful to Senator Sue Serino and Assemblymember Didi Barrett for the financial support that allows the Stabilization Center to save lives and serve families. As we extend thanks to so many, there is one group of Americans who deserve our unyielding gratitude: those who serve our country and return home face many challenges. And this year we expand our support and services. Some veterans carry physical and mental scars from their service. Those of us who have never served can never know the effect … but we can be here to help. Some of the mental health resources I’ve discussed already will prove invaluable. The Veteran’s Resource Center at DCC is providing critical help, and funding provided by Senator Serino has enabled us to offer a peer-to-peer program for veterans. To assist with veterans’ transportation needs, we will provide a new van in partnership with the Disabled American Veterans. We’ve added staff and programming at our Division of Veteran Services, and Dutchess County is seeking state approval for a Veteran’s Court to aid those trapped in the criminal justice system. We owe them much more – and we will always seek to do more – but let us thank these heroes for their service to a grateful nation. When I was that “kid mayor,” it never occurred to me that I was aging. But despite how young we feel, we are all indeed getting older. And as those in our family age, challenges grow bigger. Our Office for the Aging does tremendous work, and this year we have added home health aide support to help families and assist more seniors. We are expanding our home-delivered meal program from four to five days a week, and we are improving our Senior Friendship Centers, including adding an extra day of service at our center in Pawling. Providing for a growing senior population requires we meet current needs and evolve to address future ones. We just cannot accomplish that from the top floor of an old building with an even older elevator. So this year, we will proceed to move the Office for the Aging out of its High Street location to modern, more accessible office space. Having begun to visit and review modern senior centers in other parts of the state, and knowing our current facilities, we have an opportunity to do more in Dutchess. In working with Senator Serino, I propose we construct a Senior Services Center. Together, Senator Serino and I envision a regional innovation center for seniors. The Senator, as Chair of the Senate’s Aging Committee, has committed $1 million in state funds to make this a reality. Our goal is to develop an integrated senior center platform that can be replicated across the state. We will maximize other funding opportunities and consolidate rental spaces to minimize cost. But we will create a place to provide services, host programs, and serve our seniors as they ought to be served. “The family that plays together stays together,” and by extension, communities with great places to play are, well, great communities. Dutchess County parks are among the finest in New York and have been consistently recognized by residents and visitors alike. Each is distinctly Dutchess and provides a unique experience. We completed our disc golf course at Wilcox in Milan, and it’s already attracting amazing use and playing host to tournaments and competitions. Renovations are near complete at our only park with Hudson River access, Quiet Cove. We are adding restrooms to the Harlem Valley Rail Trail and, thanks to funds advocated for by Assemblymember Barrett and U.S. Senator Chuck Schumer, we are working to complete its connection into Columbia County. Use of the Dutchess Rail Trail continues to grow, as we host runners, cyclists, cross-country skiers, snowshoers, and walkers of every age and ability, along with formal runs and the very popular Walkway Marathon. Should the State Legislature approve Governor Cuomo’s Empire State Trail, Dutchess is ready to assist, as the DRT would be a major component. We will finalize negotiations for a long-term agreement with the Hudson Valley Renegades to keep hosting minor-league baseball and continue to improve Dutchess Stadium. We are even partnering with the Village of Tivoli to develop a trailhead at the White Clay Kill Creek at County Route 78. As we move forward with new investments at these and the “best park” in the Hudson Valley, Bowdoin, we will develop a comprehensive plan for our entire park system, with a focus on opening access to individuals of every ability. Every ability. Municipal parks, county parks, weren’t built for the differently abled. Quite often, they were merely properties left by a landowner with no real plan in place. And while these serve many of our families well, Dutchess County’s park network is missing something: We don’t have a universally accessible park. I would like to change that. We are evaluating potential property along the Dutchess Rail Trail in the Town of East Fishkill to add to our park system. With access from the DRT, this property offers great views, wonderful natural resources, and will allow for fishing and other water recreation. We envision a passive park space with one unique twist: make it accessible to anyone of any ability. If we move forward, we envision a “universal design,” including trails, viewing areas, and water access for every individual of every ability. In addition to the park land, we’ve identified a portion of the site for potential private housing development. The County Planning Department will create a development plan and will solicit for private developers to build accessible housing. Access to this sort of housing, enabling independent living, is among the biggest challenges facing those with disabilities. We have seen the smiles on the faces of young people playing Challenger leagues in LaGrange and how our funding made a difference in Wappinger at their Challenger Little League Field, and nothing compares to Julie’s Jungle in Hopewell. This new park will be unique in New York and will expand our park system, improving the quality of life of every one of every ability, while making a bold statement that in Dutchess County, we ThinkDIFFERENTLY. With that in mind, our new Deputy Commissioner for Special Needs is working with our Parks and Planning staff and recreation directors throughout the county to develop ThinkDIFFERENTLY Park Principles. These guides will help communities as they improve and expand their parks to ensure greater access and more universal use by individuals of every ability. Our ThinkDIFFERENTLY initiative has become a movement. Communities in Dutchess and now throughout New York are embracing the idea, branding their own efforts, and applying the principles. We should all be proud of how we are changing minds and opening hearts. And, nothing will inspire you more than what will occur tomorrow evening. Just a few miles down the road, at the Mid-Hudson Civic Center, we will kick off the Special Olympics New York Winter Games. For the second year in a row, with a great organizing committee, generous sponsors, and thousands of volunteers, over 1,200 athletes and coaches have converged on Dutchess County to compete in these Games. In fact, athletes and representatives are here this evening; please join me in welcoming them. And be sure to join us tomorrow night and throughout the weekend. Let them show you what it means to ThinkDIFFERENTLY. This year, we will again host two movies and our family picnic, and we will launch our ThinkDIFFERENTLY website to make accessing services, programs and events easier. In partnership with the Anderson Center, we have trained businesses and tourist destinations on how to welcome and hire those with special needs; our County Clerk is implementing an employment program to help archive important records; we are moving forward with Project Safe Return personal tracking and communication devices for improved safety; and later this year, we will host a community roundtable to explore and expand employment opportunities. Last year’s inaugural ThinkDIFFERENTLY Dash was a resounding success, and we look forward to this year’s Dash as part of the Walkway Marathon weekend. We are excited to bring a new ThinkDIFFERENTLY event to eastern Dutchess in May, when we will host a special cooking class for young people with “Chopped” winner Chef Dafna Mizrahi at Monte’s in Amenia. Everyone wants a family to love them and a community to call home. Those with special needs have particular challenges, and we are breaking down barriers while opening opportunities. We are proud to see so many in our community finding ways to be more welcoming and accessible: The Dutchess County Fairgrounds will again host ThinkDIFFERENTLY Thursday during fair week; Regal Cinemas hosts sensory-friendly “My Way Matinee” movies; the Poughkeepsie Galleria is creating sensory-sensitive events; and Bounce! in the Town of Poughkeepsie will host two ThinkDIFFERENTLY Days. Our own Hudson Valley Renegades will provide a ThinkDIFFERENTLY Baseball Camp, where these great kids will learn fundamentals with minor-league players and coaches at Dutchess Stadium. MidHudson Regional Hospital is training staff to better respond to those on the autism spectrum and engaging in a County-led workgroup with other local healthcare providers, including Health Quest, to improve coordination and the level of care for people with special needs. And this fall, DCC will be piloting college-level programming and job skills training, offering the college experience to students of all abilities. Dutchess County knows how to ThinkDIFFERENTLY, as we seek to embrace those who see the world through a different window and teach each other to understand their view. As this nation grapples with great division, our newly re-established Human Rights Commission engages in a Transformative Dialogue Project meant to strengthen our diverse family, building a more tolerant, more respectful, more compassionate community. As we bring people together to learn about one another through positive and constructive interactions, step by step, the fabric of our community is strengthened. And this, ladies and gentlemen, is Dutchess County: one interrelated family, bound together. We don’t just call this place home; we work together to make it stronger. We don’t turn our backs on those in need; we extend a hand to help. We have our debates, but we don’t allow anyone from any place to tear us apart. We don’t talk at one another; we talk with one another. We come from different places but work to bring people together. We celebrate our differences, welcome varied points of view, embrace new ideas, and seek common ground. Think of who we are. Think Dutchess – where we acknowledge we aren’t always right, and we are bound to make mistakes. We don’t look for reasons to argue, we find new ways to partner. We aren’t defined by what knocks us down, but rather, how we lift each other up. Think Dutchess – a family that knows at every barbershop, water cooler, lunch counter, soccer field, and kitchen table, that’s where the heart of our community beats. It’s where relationships are built, stories shared, pain shouldered, and successes celebrated. Think Dutchess – where we seek to learn from one another, respect one another, and, with kindness and generosity, make the Dutchess County family healthier, safer, and stronger. May God bless us in our work. And may He bless Dutchess County and the United States of America. Thank you.